Lunarfurniture.com – Television is considered as one of the cheapest entertainments which can be enjoyed by people. This statement comes by the fact that due to the recent ages; the television price is getting cheaper and cheaper. If in the 90’s we need to pay millions rupiah for a set of television, right now we can pay just several hundred thousand rupiah for one. Besides of the function as the tool where we can watch entertaining programs, television attracts family members to watch the television show together and also do lot of conversations. In other word, the television watching action is pretty good for the family harmony. So many people who want to put the television on the special rack for television. This tendency is caused by the need of watching the television show in comfortable way and also to make the interior appearance of the house getting better. The television rack is easily found in the furniture shop, but there’s a problem. There are so many types of television rack which are adapted with the function, needs, and also the fit of the house type. Those types force us to smart in choosing the television rack which is match with our need. Here are the types. 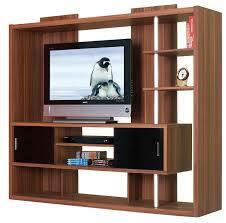 There is a type of television rack which can be room partition. This type is quite popular type of television rack, especially for those who has small size house. One type of this partition television rack has two sides which is very good to be used to dividing the room. The good thing about this double side partition is that we can divide the room without making the rooms is narrow and crowded. Thanks to the utilization of semi transparent model partition part, this double sides of television rack partition can be accessed from rear and front sides. The television set can be placed in the middle of the rack. Most people put this television rack between the family room and living room or between the family room and dining room.